Gone are the days when toilet humor, spontaneous one-liners and lost-and-found theme used to appease the audience; with the passage of time they have grown up while our filmmakers have chosen to stay inside their cocoon which sadly is stuck in the 1980s. Jackpot is one such film which would have been a hit had it been released in the 1980s but in the current era, the filmmakers should consider themselves lucky if they manage to enter the second week. Loaded with crappy humor, unimpressive acting, weak plot and blurry cinematography, Jackpot pushes the industry back by decades instead of taking it forward. Jojo (Jawed Sheikh) is a gangster who buys all but one raffle ticket of a recently launched scheme to convert his black money into legit one; however the one ticket that he doesn’t buy turns out to be the winner and the proud owners of it are named Lucky and Chandni (Noor Hassan and Sanam Chaudhry in their debut film). Jojo kidnaps Lucky only to find out that he has hidden the ticket in his coat’s pocket that his wife gives to the laundry guy to stitch (yes, that’s the plot). The laundryman Pappu (Tipu) and his wife Malika (Sana Fakhar) lend the mended coat to her cousin Sameer (Inayat Khan) who decides to keep it after clearing a job interview. He takes the coat with him to Phuket, Thailand and all follow him in search of the coat that has a raffle ticket in it. Do they manage to get hold of the ticket or does Sameer find out that his coat has more to offer, watch the film to find out the answer. The idea behind Jackpot was a good one but it came to the makers some 3 decades late. These days, such ideas are used in amateur stage dramas or B class TV plays but not in films because people pay to watch films and they don’t have time for such childish stories. In some scenes, the cinematography by Anubhay Bansal is good but it falters in more scenes, nullifying the effect. Sana Fakhar comes out as the most beautiful face in the film but that’s a compliment for her and not for the youngsters involved in the movie namely Sanam Chaudhry and Rehyna Malhotra who look like actresses from the 80s. Ismail Tara does bring smiles but that’s because he is a little better than others who were worse than anything you have seen in films this year, maybe better than Shor Sharaba. Jawed Sheikh shouldn’t have done the film although he stands out as Jojo with his line Jojo Janta Hai that pops out here and there. Everything from the start till the end is bad about the film – it shouldn’t have been made in the first place because people want to see good stories, not rehashed versions of Its A Mad Mad Mad World, Malamaal Weekly, and Dhamaal that also followed the same pattern. Noor Hassan and Sanam Chaudhry would have looked better had they been cast as a brother and sister that too of the leading pair because they neither have the spark nor the talent to carry a film on their shoulders. They should stick to TV rather than try to make it big in films because for films you have to have the oomph factor which they didn’t have. The script was so bad that it will make your stomach grovel as disgusting 80-ish humor returns to the screen here without the actors namely Mahmood Aslam, Iftikhar Thakur etc. realizing that they are spreading filth. The music is so memorable that you don’t remember any song once you exit the theatre, despite featuring a ‘Nashad’ in credits. Naveed Nashad must realize that he carries a huge responsibility on his shoulders as his father Wajid Ali and grandfather Nashad are still amongst the best music composers the country has produced. 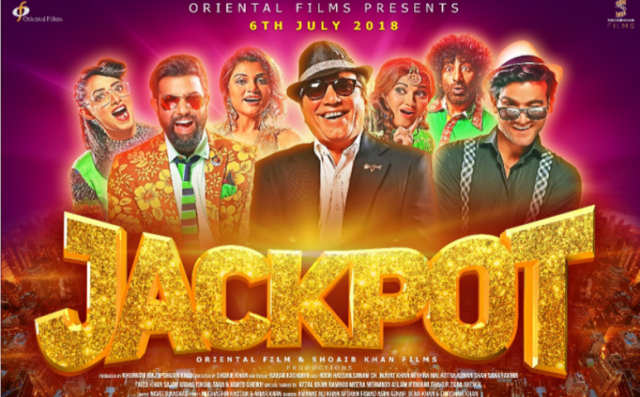 Despite having cameos from yesteryear stars including Jan Rambo, Meera, Zara Sheikh and the film’s director Shoaib Khan and producer Khurram Riaz, Jackpot fails to create the kind of impact its theatrical trailer did when it was released last month. It is saddening to see a talented writer like Babar Kashmiri wasting his talent like this and resorting to cheap tactics to make the audience laugh. The audience did laugh during the film but it was on their own choice to watch crappy cinema rather than on what was happening on the screen. Films like these make cinegoers like us demand the inception of a Quality Control department where instead of censoring a film, genuine filmmakers must accept or reject films for screening, especially the ones like Jackpot that nullify the good work of respected filmmakers and give strength to the fact that we must screen Indian films to survive.